Our long time friend Mike Casey of Sunset Beach, Hawaii is a master shaper and craftsman in all things related to surfing. One of his specialties is building wood boards. 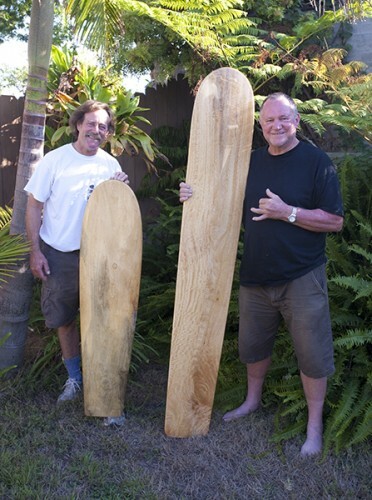 He is one of the first craftsmen to research the board shapes of the ancients and has built special boards similar to these for decades, for families in Hawaii. Mike visited us recently and was at the Sacred Craft Surfboard Show in Del Mar exhibiting with Robert Rudine and Surfari Wood Works. Mike is holding the Alaia he made from a single piece of mango wood from the islands. Steve is holding the wiliwili Papa Li’ili’i or Paipo that Mike shaped from a single piece of wiliwili, recovered from a fallen tree on Oahu. Steve and Mike made this little board for my 60th birthday in the Summer of 2010 and I am so very blessed. She is named Rella Wiliwili, as he completed shaping the little board on the day that would have been Rella’s 60th birthday. God works in mysterious ways! After watching Mike finish shaping the special wiliwili board, Steve and I drove out to Makaha to spend time and put flowers in the sea for dear Rella on her birthday. We love you Rella and will ride waves for you always. Aloha Ke Akua. For more about Mike Casey, please visit his Web site. Surfboards by Mike Casey Facebook page. No Comments on "Exquisite Alaia and Papa Li’ili’i by Mike Casey"